Mr Trump argued with several reporters during the news conference. They began sparring after Mr Acosta asked Mr Trump about the caravan of migrants heading from Latin America to the southern US border. 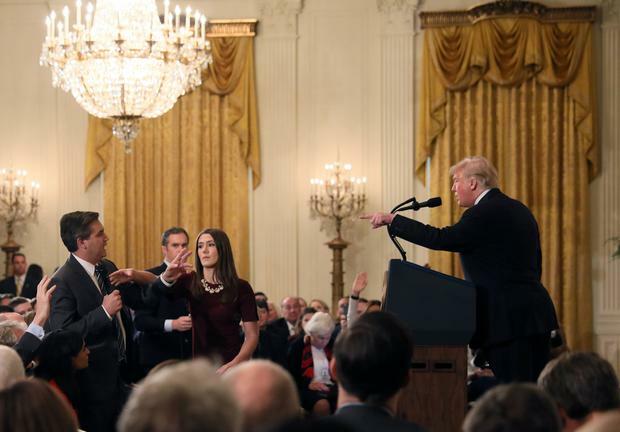 When Mr Acosta tried to follow up with another question, Mr Trump said, “That’s enough!” and a female White House aide unsuccessfully tried to grab the microphone from Acosta. White House press secretary Sarah Sanders released a statement accusing Mr Acosta of “placing his hands on a young woman just trying to do her job as a White House intern,” calling it “absolutely unacceptable”. The interaction between Mr Acosta and the intern was brief, and Mr Acosta appeared to brush her arm as she reached for the microphone and he tried to hold on to it. “Pardon me, ma’am,” he told her. Mr Acosta tweeted that Ms Sanders’s statement that he put his hands on the aide was “a lie”. CNN said in a statement that the White House revoked Mr Acosta’s press pass out of “retaliation for his challenging questions”, and the network accused Ms Sanders of lying about Mr Acosta’s actions. White House staff decide whether journalists are eligible, though the Secret Service determines whether their applications are approved. “It’s such a hostile media,” Mr Trump said after ordering reporter April Ryan of the American Urban Radio Networks to sit down when she tried to ask him a question. The president complained that the media did not cover the humming economy and was responsible for much of the country’s divided politics. His exchanges with CNN’s Mr Acosta and NBC News’ Peter Alexander turned bitterly personal, unusual even for a forum where the nature of their jobs often put presidents and the press at odds. “I came in here as a nice person wanting to answer questions, and I had people jumping out of their seats screaming questions at me,” said Mr Trump, who talked for nearly 90 minutes despite the run-ins with reporters. Mr Acosta asked Mr Trump why the caravan of migrants was emphasised as an issue in the just-concluded midterm races. Mr Acosta questioned Mr Trump’s reference to the caravan as an invasion, and Mr Trump defended the term. After Mr Acosta asked about the investigation of Russia’s involvement in the 2016 election, Mr Trump tried to turn to Mr Alexander, but Mr Acosta continued to ask questions. “I’m not a big fan of yours, either,” Mr Trump replied. “I understand,” Mr Alexander said, attempting to ask a question. Mr Acosta stood back up and began mentioning, without a microphone, the explosive devices that were recently sent to CNN and some of the president’s political opponents. After the exchange, CNN, through its public relations department’s Twitter feed, said Mr Trump’s attacks on the press have gone too far. “They are not only dangerous, they are disturbingly un-American,” CNN said. The WHCA called on the White House to “immediately reverse this weak and misguided action”. Mr Trump made several references in his news conference to how he feels mistreated by the press. He said he is damned by the press for having either too few, too many or just the right amount of press availabilities. He turned specifically on reporter Yamiche Alcindor of PBS’ NewsHour. She said that “on the campaign trail, you called yourself a nationalist. Some people saw that as emboldening white nationalists.” Mr Trump interrupted her, calling it a racist question. Mr Trump talked about his supposed popularity with black Americans and said he is more interested in advancing America’s interests than having a globalist point of view. Ms Alcindor moved on to a different topic. Later, via Twitter, she said that she has interviewed white nationalists who say they are more excited by Mr Trump than they have been about other presidents. “Even if President Trump doesn’t intend it, some see him as directly appealing to the racists,” she wrote. On CNN, anchor Jake Tapper said that there was nothing racist about her question and that Mr Trump’s reaction was unfathomable. Mr Trump told Ms Ryan, of American Urban Radio Networks, repeatedly to sit down when she attempted to ask Trump about accusations of voter suppression. He said she was rude for interrupting another reporter, though he did briefly answer one of Ms Ryan’s questions. US midterm elections: What next for Donald Trump after Democrats take House?